Started making changes to "Introduction_date" to vehicles in these sets. Where ever possible be showing Year, Month and day when these are known. Much thanks to ASide8 for provide the details. Hope in time to start adding more vehicles from other States. Been pondering for a while if should make long carriages like the ones in XUSSR Set. So I made contact with " Simozzz " one of the persons who made the XUSSR set see if I can use their work to try make my own long set. The top train is the original and bottom train is the same carriages but made longer. It is a TAM Sleeping Car entered service about 1915. What you think if I make a new train set with the longer carriages? ASide8 and I are still working on new data for the train sets. Today I been in Sydney at Railway Archives getting the actual dates rolling stock entered service and n some cases when the were condemned. This will take us at least several weeks to do this updates and add some more rolling stock. Eventually I like to make a set with the longer vehicles, but will finish the new data entries to the sets I been working on past few years first. This way you will have a choice play with the normal sizes or the extended sizes. The data I got today will take me a few days to enter this and when finished will provide the updates here. Still updating the Introductory dates to locos and rolling stock .. going to take several weeks as need to visit the Australian Railways Historical Society a few more times and I can only get there on Tuesdays. Adding Wright Coaching Stock to game .. these were the first passenger carriages in use when the railway started between Sydney and Parramatta in 1855. I did have some 4 wheel coaches by they wasn't the original type. Need to also change the colours as those days they was varnished and not painted the maroon (also known as Tuscan). Maitland Steam Festival is on weekend of April 14 and 15th. There 2 steam locos heading to it from Sydney on Friday 13th. Returning Monday April 16: Departing Maitland 9:45, Gosford 11:50 to 12:40 pm, Hornsby 1:45 and Concord West 2:20 pm (they are not going to Sydney). The 2 steam locos will be 3642 and Beyer-Garratt 6029 hauling vintage 1930s carriages. Unfortunately I will not be riding any, but hope to get some photos. Here the updates to the train sets. All Locos have actual dates they entered service where ever possible. Costs to purchase locos and rolling stock are now a lot cheaper. Some half to how had before and some cheaper still. I picked up a book today called New South Wales Steam Locomotive Data dated April 1966. It had the purchase costs of all Steam locos except the Beyer-Garratt's for the State of New South Wales. So I changed the cost_factor: in code to get as close as I can to the real costs. Minimum is $4686 and multiply that to get a figurer closer to what the actual cost was. Unfortunately unable to use decimal points .. so costs inclement of $4698, $9372, $14058 and so on. Hope this makes it a lot easier to start a game in 1855. Be several weeks or more before these will be released on Bananas. If you feel some are to cheap or nor cheap enough please let me know. I went train riding to day to see some steam trains. First one I seen at Awaba station was a 60 class Beyer-Garratt. It has a 42 and a 40 class diesel behind it as well as some old carriages from the 1930s and some that was used on the Southern Aurora and Brisbane Limited trains many years ago. A 36 class steam loco 3642 about to pass Booragul Station. Affectionately know as a PIG because of the snorting sound it made when in motion. It is hauling old carriages from the 1930s that was used on country service, especially the mail trains. Woops forgot to load this one of the Garratt showing the 2 diesels. The 2 steam trains ran parallel running today. This photo taken at Tarro Station located between Newcastle and Mailtland. There was suppose to also be a Tiger Moth plane flying with the trains but the wind was too strong today. I had difficult trying to keep my camera still. Looks like you had a field day! Very nice pictures, thanks for sharing. Enjoyed the morning very much even though it was very windy. Have to find a program to make the video clips I took smaller so can up load them here too. My table records them as mp4's and the video of those steam trains is 78MB. Been brought to my attention that some of the GRF files I released on Bananas is confusing to know which one are the newest. I never looked before as I always copied my files to my game direct. But I did look and yes they are right .. it is confusing. So what I in process doing is all the ones that are older I putting the words *** THIS GRF IS OBSOLETE *** in the contents. .. to the right in "CONTENT INFO" in "Description" if the file is old it will have the words "*** THIS GRF IS OBSOLETE *** "
Hope this helps you find the newest sets. We've got eye candy road vehicles for the game .. so what about eye-candy vehicles for the train tracks as well? Track Inspection vehicles. Can operate as separate vehicles or as one. Can join them as if a train but they will have the gap to separate them. They have flashing lights on the cabs and have diesel fumes when starting. Top speed 40 km/h. You can give them orders or just let them lose to get in the way of the trains. Only 2 so far and might and some track machines once I get some good photos of some. Want to try and give me your opinion before I add them to the other train set. Not sure how Garry feels about me posting this, but here goes nothing. I'm working on C34 sprites for addition into the game. According to Garry, the coding's ready to go, and the sprites are probably a well-spent weekend away from finishing. Don't touch me, I'm spriting! All views are my own and aren't that of Garry or anyone else who's helped with AuzTrains or any of his other projects. Your more than welcome to add what your doing here. You already done some EMUs and Steam so show what you done here in a screenshot. Garry, you're putting me under pressure! I'm just kidding, I'll post what I have in a few minutes. File comment: My contributions so far. Top: C34 with a few of Garry's dogboxes. This is my latest contribution, and is still under construction, so to speak. I don't believe it's in public builds yet. Middle: Black C35 with some of Garry's N type carriages. This was a reskin of Garry's blue C35. Bottom: The new B set sprites, still under construction as well, but nearly there. That's it for now, other than a few specs changes here and there. Next year Australia is introducing new passenger trains to operate on the suburban network of Sydney and Newcastle. These trains will not have guards manning them. Do you have passenger trains in your country that do not have guards .. only the 1 driver? This idea might work if every station is manned and the station staff watch for the safety of passengers joining and alighting from trains, but we have many stations here with no one on duty. I'm fairly sure it's the same thing in Germany. Conductors or what'cha call them aren't in every regional train and some train types don't need anyone but the driver anymore. Making a Eye Candy Rail Vehicle set. Did 2 vehicles before to test in the AuzTrainsNSW and they work ok. 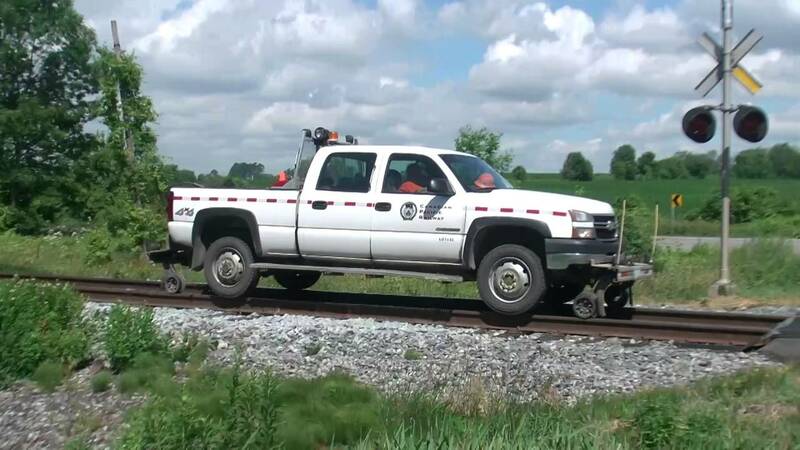 But some players might prefer train sets from other countries but still like to have some Track maintenance vehicles blocking trains while they carry out track inspections. So I made a set called Auz Candy Rail vehicles. They only have the 2 Hi-Rail Vehicles at the moment. I been collecting photos of different types of vehicles and hope to add more. These 2 become available in 1960 and have a top speed of 40 km/ph. They do not carry passengers and cargo. They can be used separately or if join them they will have the gap between them. So here the new file AuzCandyRailVehicles. I have removed them from the AuzTrainsNSW set so here that update too .. also made a few other changes with cost to purchase many locos and vehicles been reduced. If you have any photos you've taken of track maintenance vehicles feel free to upload them here and I see if I can design any of them for the game.